Chirp! was created on October 5th, 2001, which means that I've been running this thing since I was a silly little fourteen-year-old. First I thought about creating some kind of Piyomon support group, but decided to make a fansite instead because I was so freakishly obsessed with making fansites back then. I swear I had like a MILLION. 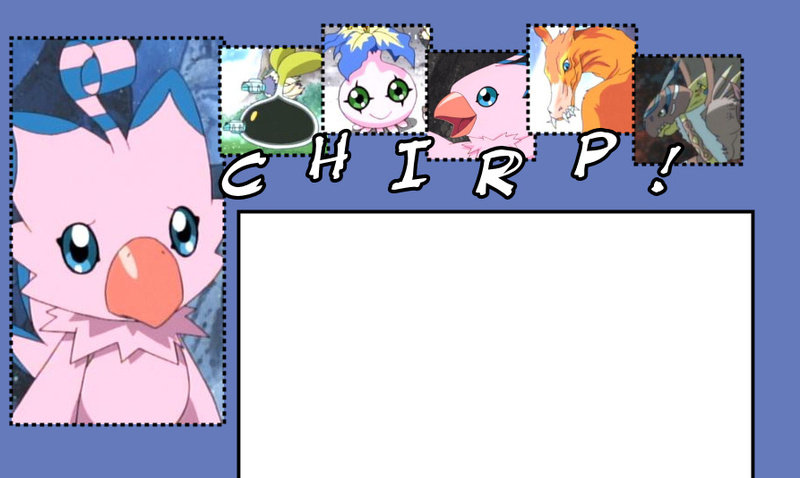 Anyway, I named the site Chirp! because of obvious reasons; 'piyopiyo' is the sound of chirping in Japanese, and it symbolizes Piyomon's chirpy and bird-like personality. The site was first hosted at Eccentrix.com. When I got my first domain, it moved there, and then to my second domain. The site was alive and kicking for over three years - then, in the beginning of 2005, my second domain's host decided to eat all my hard work alive. Chirp! and all my other websites DIED. This historical event is known as The Great Hostyard Website Massacre. Be afraid, be very afraid. After months of being Chirp!-less, I got a sudden kick of inspiration and decided to bring it back, this time hosted at the very reliable Start.no, at least I THOUGHT it was reliable. Realizing that the only way to get a swell host is to pay for it, I bought a new domain, Swellpage.com, and moved Chirp! there. And now you knoooooooooooow the rest of the backstory! Good day?